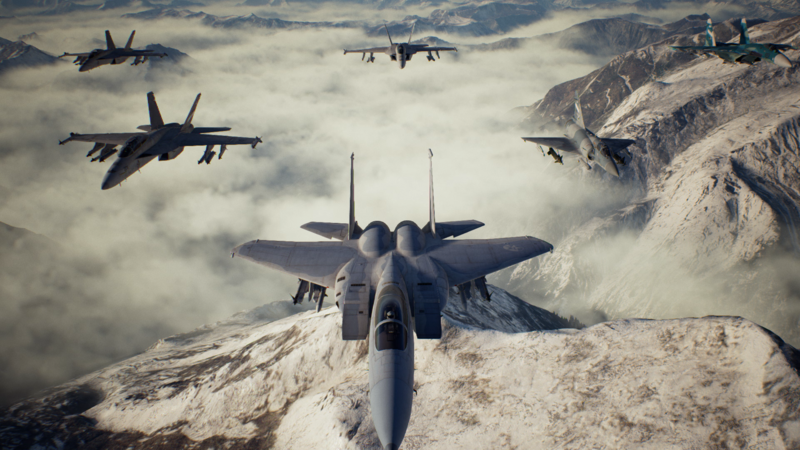 Ace Combat 7: Skies Unknown is the latest in Bandai Namco’s long-running flight combat series. While the series has had a few spin-offs in the last decade, the last numbered title in the series released way back in 2007. I wanted to preempt this review by saying I don’t have any experience with the series. In fact, I did not know the series even existed until this one was announced in 2015. Moreover, I am not a huge fan of vehicular games, but I decided to give this one a go mostly thanks to its much-touted PSVR support. With that said, let’s take off! 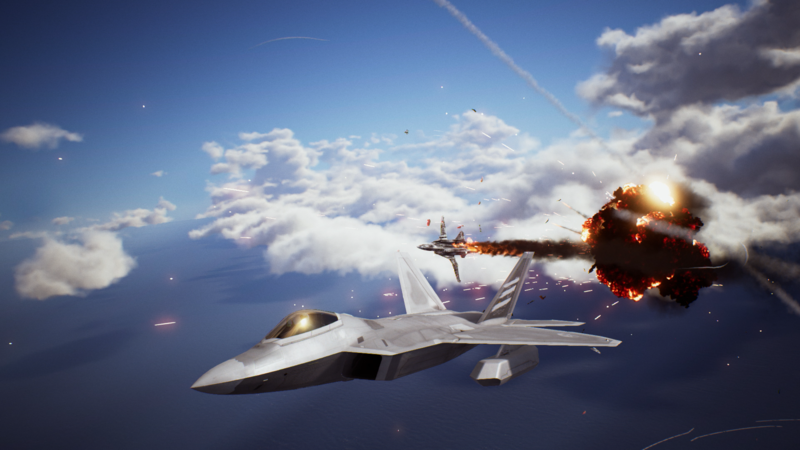 Ace Combat 7’s campaign places you in the shoes of a rookie fighter pilot as you fly across a fictional world map (inspired by our real world) and take down enemy combatants using a state of the art fighter jet. There are a number of missions in the campaign and they all provide enough variety between different mission objectives, aircraft upgrades and a number of interesting bosses to fight to keep you going. I’m not quite sure what else could be added to the campaign without risking the series’ grounded feel and going too outlandish. Nonetheless, it would’ve been nice to do something outside blowing up aircraft carriers. Some may find it engaging, but for others the honeymoon period will wear off quickly, as it started to do with my experience. The game’s writing is pretty average and I didn’t care too much to even remember characters or plot points. This is further exacerbated by the low budget cutscenes, mission briefing and voice acting throughout the game. I often felt like the story and characters were only slotted in to provide some level of context to what you’re doing, so I imagine most people won’t mind. I couldn’t tell you where I was fighting, who I was fighting for or why I was fighting at all. All I knew was that the red square on my radar was the enemy and they had to die. When I am destroying the enemies, the game soars. I was surprised at how fun flying an aircraft and blowing up targets with 2 weapons could be. The game offers different controls depending on your flight efficiency as well as a plethora of other options for players to get comfortable with. I was quite the red baron flying my jets in the Battlefield games, so I had some familiarity with the basic controls. However, the expert controls are a little challenging to master and could prove to be a bit overwhelming in the heat of the action, when you’re dodging missiles while keeping targets in your line of sight amongst a flurry of other mini-dogfights going on at once. All of these factors combine for a surprisingly strategic game with a respectable level of complexity and depth. Other instances such as weather effects, land vehicles and multiple objectives can create a very entertaining round of memorable moments, while changing the way you need to play to adapt to the conditions. For example, flying through clouds can leave condensation on your windshield, jam your radar and can even freeze your aircraft if you linger in one too long, but it can also provide some nice cover to dodge incoming enemy missiles. There are a whole suite of aircrafts to choose from in addition to a variety of customization options like upgrading your primary weapons, special weapons and stats through the currency system. There is seriously a lot here, affecting each and every facet of gameplay. This surprised but overwhelmed me at the same time. I don’t plan to play this game for a long time due to pure preferences, so it was difficult remembering what each upgrade does or which ones I should stick with. I played around with a few options and all of them felt satisfying but nothing too unique that it stuck with me. The skill tree the in-game is also pretty substantial, which could make beginners like myself even more confused. While the visuals in Ace Combat 7 are acceptable, they are nothing to drum home about. I personally thought something like DICE’s Battlefield 1 had more impressive visuals, particularly when flying overhead. The mainland has noticeably low textures and, outside of the weather effects, I wasn’t particularly in awe of it. However, this could be explained by the high and generally smooth framerates that the game offers, which for a genre like this makes sense. The audio design is spectacular, though. When wearing earphones, the jets sound like the real thing (Playstation 4 fans notwithstanding). From take-off to sending enemies to oblivion, everything sounds authentic and firing off missiles gives that nice ‘kick’ you’d expect to hear when pulling the trigger. Even the radio communication coming through from your team back at base makes it really feel like they’re counting on you (jokes on them). The in-game radio also provides helpful information on the mission status and anything else worth worrying about. 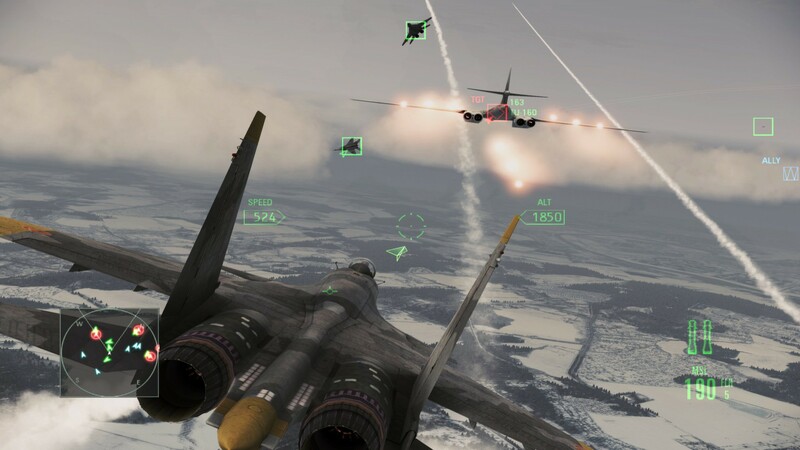 While incorporating a campaign is a welcome addition for solo players, Ace Combat has always prided itself on its multiplayer mode. While I struggled to find a lobby, I noticed there are both matchmaking and hosting options, which is a welcome sign. The game launches with two modes; a regular team death match mode and… you guessed it, a battle royale mode! Although, I must mention that the mode titled “battle royale” is just a basic free-for-all mode with little to connect it to the games that made the term so ubiquitous. Overall, this is a low and unexciting offering of modes. Having only two modes might help players find more matches, but the actual modes themselves are kind of so-so. The real reason I wanted to play Ace Combat 7 was to try its PSVR mode. I tried a demo of it two years ago and I liked what I played, excited to see more. Unfortunately, two years later and the development team have only managed to add an extra 2 missions, lasting under 20 minutes each. It really is a shame as the VR component is quite possibly the best thing about Ace Combat 7. Everything from taking off to barrel-rolling, destroying targets and going through cloud clusters is one of the most immersive experiences I’ve had in VR. So immersive that it’s one of the first VR games since first trying the device where I felt a little queasy at the beginning. Understandably so though, as I’d probably feel the same if I piloted a real jet in the same way. However, after about a minute I was in the swing of it again. There were literal moments where I was soaring past an island, while looking through the side window screaming “Woo-hoo, I’m king of the world!” (with my partner shaking her head behind me). I can only imagine how it must feel to play this with a HOTAS controller. Moreover, there are actually a small-but-decent amount of aircraft and customisations you can make in the VR mode, to give each of the missions some replayability as you attempt to beat your score. Outlines of models were admittedly a little jagged, but once you’re in the air it’s hard to notice any blemishes as you slowly trick yourself into thinking you’re in a jet. This is exemplified further with the UI and interface being located on your actual dashboard, complete with mini-map. Hearing commands, warnings and updates come through my headphones while the engines of an enemy jet races past me sounds incredible with the 3D audio. I couldn’t shake the feeling while playing the mode that this should be more than what it is. I’m hoping this was a case of testing the waters and hints at a more complete VR package to be offered in the future because it owns, and makes it hard for me to go back into the flat screen mode of the game. Aside from the VR implementation, Bandai Namco knew exactly who they were making this game for; Ace Combat fans. The controls are tights and the options are plentiful, but both can be overwhelming to newcomers. The story, mission objectives and multiplayer modes lack in variety and might prove to be dull for some, but Ace Combat players never really cared for that in the first place. The game looks good enough, but veterans aren’t going to be staring at the trees and crashing into the ground like me. However, there might just be enough little things that Ace Combat 7 brings to the table to attract some new fans. There are accommodating control options, a solid campaign and an outstanding (if lacking) VR mode to hook them in. 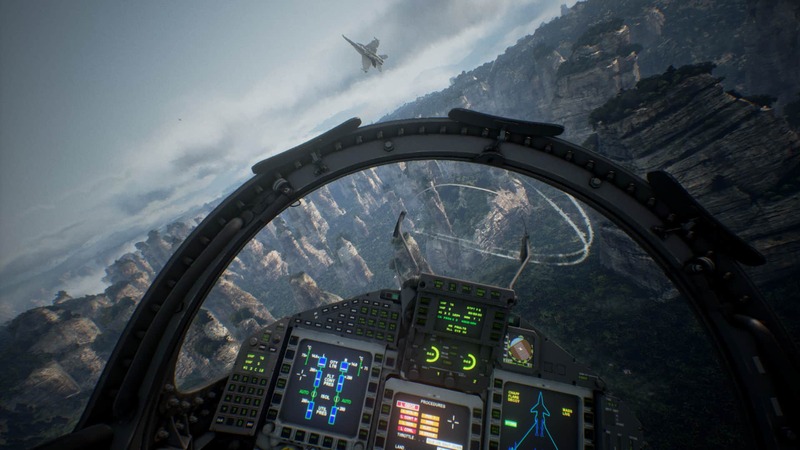 Ace Combat 7 isn’t for everyone, and that’s totally ok. If you already love the series, you will love this entry.